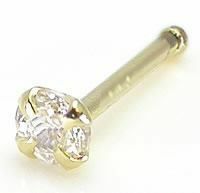 20g 14kt Yellow Gold 2.5mm CZ Nose BONE Solid 14kt Yellow Gold Nose BONE with a 2.5mm CZ Gem 20g with inner diameter of 5.5mm 20g is .80mm, which will fit perfectly in an 18g nose piercing. This is a Prong Setting. The Gem is set on this so it actually lays flat on your nose.